Since 1978 with the STANAG 2116 NATO uses a standard rank scale which enables the armies to compare and class corresponding ranks of the other nations (and different branches of the armed forces) which, by tradition and/or particular need, use different terminology. Although the NATO Codes for Grades of Military Personnel are easily accessible on the internet they are not very communicable for the journalists and their public. In their texts they use common and direct translations, yet these can easily obscure the real rank of the soldier in question, which concerns all classes of ranks, and especially the Non-Commissioned Officers and the Warrant Officers. Twenty Army ranks exist in the Czech Republic divided among six classes or rank corps, like for the most of the other NATO armies: Troops (mužstvo), Non-Commissioned Officers (poddůstojníci), Warrant Officers (praporčíci), Junior Officers (nižší důstojníci), Senior Officers (vyšší důstojníci), and Generals (generálové). The NATO system is based on the U.S. military pay grade system with minor differencies, and it recognises nine ranks within the Enlisted ranks cathegory (which comprises the Troops, Non-Commissioned Officers and Warrant Officers classes) coded from OR-1 to OR-9, and ten ranks within the Officers cathegory (comprising the Junior and Senior Officers and Generals classes) coded from OF-1 to OF-10. The levelling of the army ranks through the NATO system is pefectly clear. The problem concerns translations of national terminologies, as common texts can hardly work with codes, unknown to readers. The first three ranks within the NATO system, OR-1 to OR-3, are „privates“ in the United States Army, PV-1 and PV-2 for the first two, and Private First Class for OR-3. The Czech Army has two own ranks for OR-1: „vojín“, which translates literally as private, and „svobodník“ – where problems begin: the term is usually translated as „private 1st class“ or „lance-corporal“, but both terms can be misleading, as Private 1st Class is OR-3 in the U.S. Army, and Lance-Corporal is OR-3 in the British Army. OR-2 in the Czech military is „desátník“, which translates as corporal. Literally it is based on the number ten („deset“), leader of ten men, squad leader. Yet again: corporal is OR-4 in both the U.S. and British Army. OR-3 is „četař“, a term translated by tradition as sergeant: OR-5 in the U.S. Army and OR-6 in the British Army, two or three ranks above the Czech one. The word „četař“ is based on the Czech expression for platoon: četa. OR-4 of the Czech rank system is „rotný“, translated usually as staff sergeant. The word is based on the Czech term for company: rota. Company sergeant perhaps, which would create another confusion given the Irish Company Sergeants are equal to the U.S. First Sergeants or British Warrant Officers class 2, and these are OR-8, four ranks above the Czech NCO. And even staff sergeant is a misleading translation, as this rank is OR-6 in the U.S. and British Army. OR-5, „rotmistr“, is the lowest Czech rank within the Warrant Officers class, which begins, in the British Army, at OR-8. A literal English translation is difficult, the word „mistr“ translates as master, and the expression contains again the root of the word company. Company master, master sergeant. Yet it usually translates as „First Sergeant“. OR-6 is „nadrotmistr“, translated as master sergeant (with the „nad-“ prefix it would read as „senior master sergeant“) , but Master Sergeant is OR-8 in the U.S. military. OR-7 to OR-9 are „praporčík“, „nadpraporčík“ and „štábní praporčík“ translated as warrant officer, senior warrant officer, and chief warrant officer (literally „staff warrant officer“), where the literal translation is rather correct and matching. 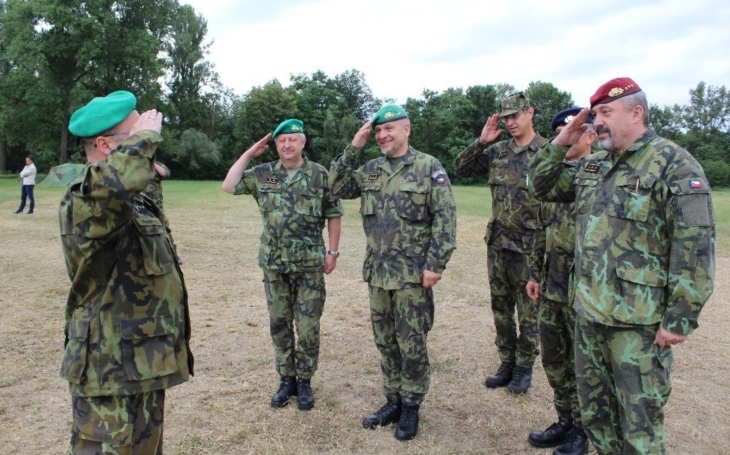 And no problems occur within the Officers class, all terms translate easily in English, and answer their American or British counterparts literally: OF-1 as „poručík“ and „nadporučík“: Second Lieutenant, (First) Lieutenant, OF-2 as „kapitán“: Captain, OF-3 for Major, OF-4 „podplukovník“: Lieutenant Colonel, OF-5 as „plukovník“: Colonel, OF-6 as „brigádní generál“: Brigadier General, OF-7 as „generálmajor“: Major General, OF-8 as „generálporučík“: Lieutenant General, and finally OF-9 as „armádní generál“: General (of the Army). As illustration we may refer to the recent incident during which three Czech servicemen were killed in Afghanistan, on the 5th August. They were mentioned, by the world media, with the English translation of their ranks usually as Staff Sergeant Martin Marcin, and Corporals Kamil Beneš and Patrik Štěpánek, but were, in the Czech system, OR-4 and OR-2; not OR-6 and OR-4, as the English speaking world might have understood. And they were all promoted posthumously to the rank of Chief Warrant Officer („štábní praporčík“), or the highest rank for the enlisted, OR-9.